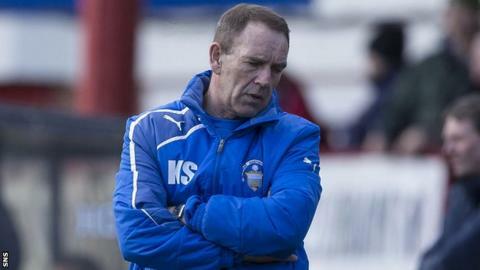 Kenny Shiels is anxious to return to football "pretty quickly" after leaving Greenock Morton in the wake of a 10-2 defeat by Hamilton Academical. Shiels resigned after Accies won but missed out on promotion - though their margin of victory would have sealed the title had Dundee drawn and not won. Morton had already been relegated from the Championship but results in the preceding weeks had been positive. "You live with it," Shiels said of the heavy loss at New Douglas Park. "You can't wait for an opportunity to get some emancipation and get relief." The Northern Irishman took over at Cappielow in December following Allan Moore's departure. However, Shiels could not prevent the Greenock side dropping into League One. And he admitted on BBC Radio Scotland's Sportsound it would have been difficult to carry on at Morton following the 10-2 loss. "Managers should really be putting the team before everything and the only thing that comes before the team is the club," he explained. "I felt that if I stay on on the back of that defeat, the supporters will have a negative feeling towards the club because of the existing manager. You get pigeonholed as the manager who was involved. "It was just a horrendous game for us. It's not something you like to talk too much about because you feel as if you've let so many people down and that's how I feel. "The form going into the game was good. We beat Dundee and didn't concede any goals. We didn't concede against Livingston, we beat them. We didn't concede against Dumbarton. We drew 1-1 with Falkirk. "Everybody felt we were turning the corner and then that one result just kicks you. They've had a hard season with Allan and then myself. It's been difficult for the supporters. "Chairman Douglas Rae has put his life into Morton. He's given everything that he has. It's him that I feel for the most, more than any supporter, director or staff member. It was a kick in the teeth for him." However, the former Kilmarnock boss does not believe he will find it hard to find a new job. "I've got a lot of skills in football," he added. "I'll come back stronger for the experience. I know I will. I'm a fighter, I'll come back and fight to do what I feel gets me a good position in football again."